The Larson Electronics MGS-480D-4X30A-30KVA-208Y.120-6X15A-1X30A-RD power distribution substation converts 480V AC electrical current into three phase 208Y/120V AC. Equipped with a manual-crank cord reel, this unit provides operators the ability to safely tap into and distribute 480V AC power from a variety of sources including generators and direct grid power. The MGS-480D-4X30A-30KVA-208Y.120-6X15A-1X30A-RD portable power distribution system gives operators the ability to power their three phase 480V, 208V and 120V equipment from a single system. On the primary side, operators connect 480V line-in power via 35` of Type W cord with a 4100P7W cord cap and to one L17-30R receptacle and three L20-30R receptacles for 480V equipment. 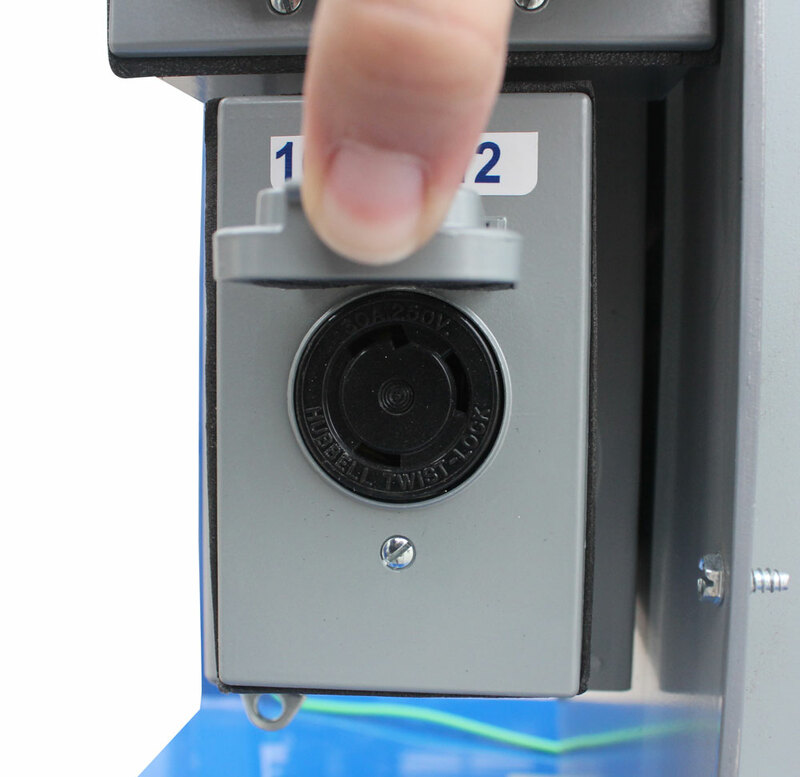 On the secondary side, operators connect to one L15-30R receptacle for 208V equipment and to six 5-15R GFCI receptacles for 120V equipment. All receptacles are equipped with weatherproof covers. Operation: The 40` Type W line-in cord with a 100-amp 480V 4100P7W cord cap brings 480V three phase power to the NEMA 3R 100-amp 480V three phase main circuit breaker panel, which contains one 40-amp 3-pole 480V breaker and four 30-amp 3-pole 480V breakers protecting one 30-amp 600V-rated L17-30R receptacle and three 30-amp 347/600V L20-30R receptacles, and passes power to the transformer. The NEMA 3R 30KVA transformer converts 480V power to 208Y/120V three phase and passes the current to the secondary panel. 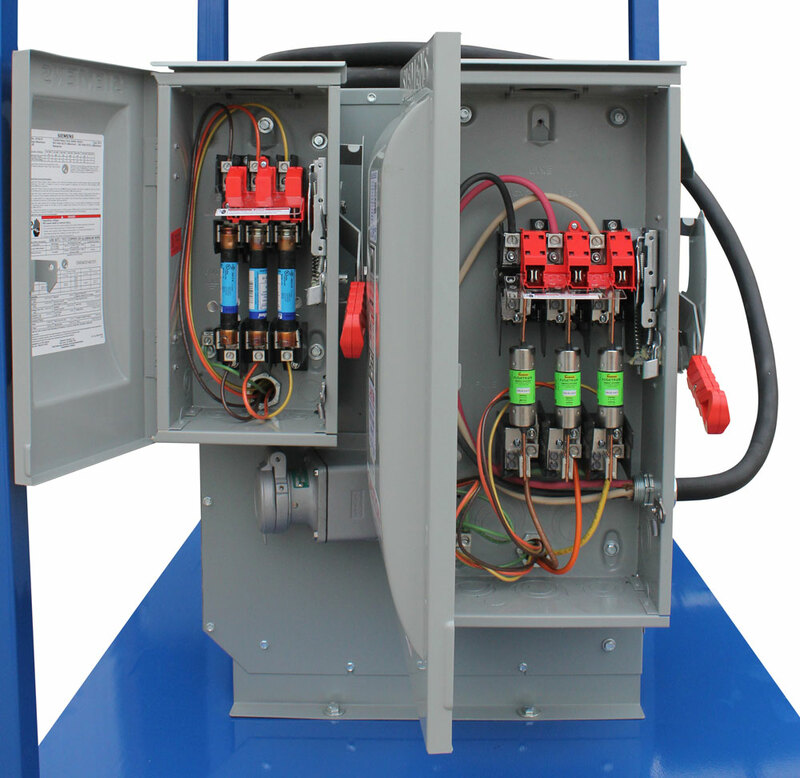 The secondary side of the transformer feeds a NEMA 3R 100-amp 208Y/120V three phase main lug panel. This secondary panel contains one 30-amp 3-pole 250V breaker protecting one 30-amp 250V L15-30R receptacle and six 15-amp 1-pole 125V breakers protecting six 15-amp 5-15R GFCI receptacles. Cable management is provided via an included manual-crank cord reel that provides storage for the 40` Type W line-in cord when not in use or during storage. Operators can utilize the cord reel to keep the cable organized when deployed around the work area.